I was folding towels on the counter when I looked in the mirror and noticed, over my shoulder, the small white stool pushed in the corner of the bathroom. It has been, for I don't know how long, maybe as long as we've been in this house, the stool the boys use when they're brushing their teeth, or washing their hands, or filling up a cup of water to drink. That stool makes a creaking scrape of a sound as it's pulled across the floor, which is amplified by the shower tile, so, in the middle of the night, you're always notified when someone short is thirsty. It's not been used in months. The boys are taller, getting so much so that there are times I have to squint to see the baby in their faces. This whole growing up business happens both in secret little bursts and slow, steady progress. It seems persistent and yet surprising that they're getting bigger, and it's all of a sudden May and the school year's almost over. In response, I made breakfast. A hot breakfast, a full-flavoured, full-bellied assignment, as one does. A celery root and potato rösti with Gruyère and eggs. The recipe came to me by way of Caroline Wright's new book, Twenty-Dollar, Twenty-Minute Meals. Though her recipe feeds four, I split the portion to feed one and three, respectively. For me, I nicked a generous handful of the celeriac potato strands and pressed it into a small skillet, while I took the remainder of the mixture and, as per instruction, cooked that in a larger skillet alongside. When mine was done, an egg was cracked and slid on top, then the Gruyère, and a generous seasoning of pepper. Under the broiler it went, until the white was set. 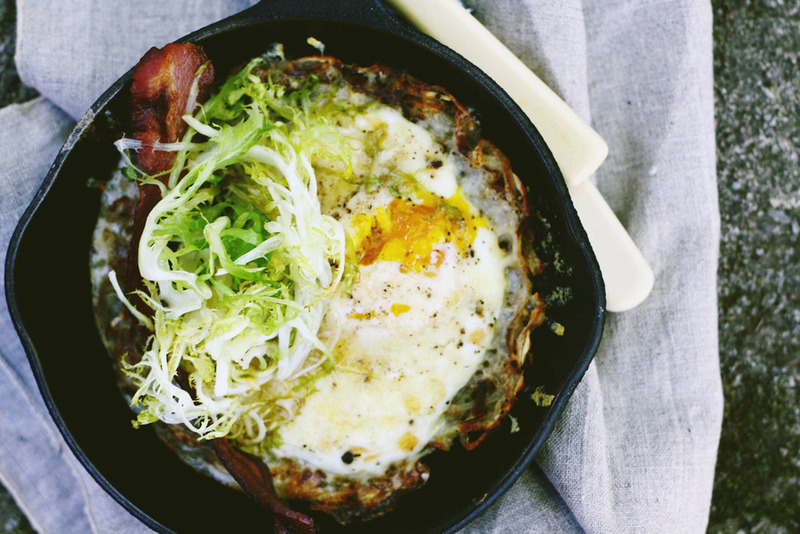 The egg white, left to its own devices for that blasting, eked its way into the nooks and gaps of the rösti, filling in those spaces, and melding into a chewy, brown edge with the vegetables and cheese. That's not to say that the rösti itself is a slouch. It isn't. In the pan, the combination of potato and celery root turns solidly golden and interesting, with the grassy notes of the celery coming through and going nutty. The method of its making is fuss-free, yet the rösti approaches elegant. Since I am happiest when there's greens with eggs, I couldn't help but pinch some twisty leaves of frisée from the crisper and snag some bacon too. The sharpness of the endive balanced out the sweetness of the celery root and the stodge of the potato and the richness of the egg and cheese. The salty crunch of the bacon brought another texture, and, come on, there's not need of convincing. It's bacon and eggs and potatoes and cheese. It's an easy sell. Can I confess? It felt like cheating. Here I was, in the funny light before the sun is properly up, I'm in the backyard eating a feast of a breakfast, on a weekday no less, and everyone else's lunch? Pretty much taken care of! Already! All I had to do was rewarm the larger rösti I'd made, crack some eggs, dress some greens, and, done. Excerpted from Twenty-Dollar, Twenty-Minute Meals (©2013) by Caroline Wright. My congratulations and cheers to Caroline upon its release. Used by permission of Workman Publishing Co., Inc. New York, all rights reserved. The recipe here is reformatted from as it appears in the book. Preheat the broiler with a rack in the top position. Coarsely grate the celery root and potato into a medium bowl; toss with cornstarch and rosemary. Season generously with salt and pepper. Heat olive oil in a large nonstick ovenproof skillet over medium-high heat. Add the celery root mixture, pat it into a large pancake, and cook until browned on the underside, 5 to 7 minutes. Slide the pancake onto a plate, then carefully flip it back into the skillet to brown the other side, 5 to 7 minutes. Remove the skillet from the heat. Crack eggs on top of the pancake, sprinkle with Gruyère, and season with salt and pepper. Broil until the cheese is golden and bubbly and the egg whites are set, 3 to 5 minutes. Caroline suggests another combination of parsnip with thyme and Parmesan. In my laziness, I grated the potato and celery root in the food processor, which makes quick work of the job, but will leave the vegetables damp. I sprinkled the shreds over a lint-free tea towel and then folded the towel over, pressing out the liquid. I came back about 5 minutes later, fluffed up the strands, and they were dry and ready to go. As said, I tossed some frisée with olive oil, lemon juice, salt and pepper, and bunched that up on top of the r östi. The bacon happened to be hanging around. Once Molly (Wizenberg) wrote of wanting "pâte brisée for a pillow", and it was a statement so perfectly, poetically apt that it's stuck with me. With ardent hope she doesn't mind the tug at her coattails, I submit that if a puff of pastry is where you'd lay your head, with a bed of onions beneath, you just might desire the layers of a potato gratin for bedclothes. I see that my addition stretches her neat metaphor into something excessive in it's total carbohydrate intake, but the sentiment holds true - potato gratin and an Alsatian Onion Tart hit very much the same notes of butter, cream and those marvelous, golden flavours brought about in baking. A good potato gratin has a gentle crisp at its top, a smoothly-set layering of potato and cream underneath, where the neat strata of each ingredient may be appreciated by the eye, but is hardly so to the tooth. This gratin comes by way of David Tanis, from his latest book The Heart of the Artichoke, and it is my idea of what a gratin should be. Too often we're offered watery, weepy versions, where the potatoes are wholly undercooked or are gravely underseasoned. Tanis's gratin is as simple as simple can be, held only to the essential ingredients and arranged in unvarnished, glorious harmony. Actually, this whole book is my idea of what a cookery book should be. There's an easy conversation to be found on his pages that appeals - the tone is that of reading the words of a friend, a very smart, very talented friend, but a friend all the same. The recipes are arranged in seasonal menus with notes on cooking and gentle suggestion of technique. His tastes are varied, so you'll find jalapeno pancakes, black sticky rice pudding with coconut cream, and roast suckling pig (not all together). Look at me go on. I've been distracted completely from what we're supposed to be talking about. Let's just say it's a really good book and leave it at that. This potato gratin. We had this over the weekend, the Jansson's Temptation variation (that's fun to say), if we're getting into details. It was a long weekend; a statutory holiday in some parts of Canada. Such lazy days are the ideal setting to potato gratin, as they do take time. Not to make or eat, but to let them cook slowly and languidly so that they reach the velvety standard we're all hoping for. This won't let those hopes down. It's the gratin to end them all, with my special fondness tied to the Jansson's as said. The onion sweetens the cream slightly, and the anchovies mitigates all with a profound salinity. Eaten the next morning, warmed moderately with a poached egg and a salad of the most peppery, bitterest greens you can find, it's exceptional. In nice bit of news, Sheri and Shari kindly invited me to visit their marvelous site this joy+ride. We had a chat about winter and cooking, and there's lots of photographs to share. If you'd like to take a look, here it is. You'll note I talk about Tanis there, so sharing this recipe today felt right. Thank you dear ones for having me. From the book The Heart of the Artichoke by David Tanis, (Thomas Allen and Sons, 2010). A good gratin is probably the only thing you can serve at any dinner table that everybody will love. Of all the versions, I prefer this tradition French-style gratin, made simply with potatoes, cream and butter. Preheat the oven to 375°F. Peel the potatoes and put them in a bowl of cold water. Smear a baking dish thickly with butter. 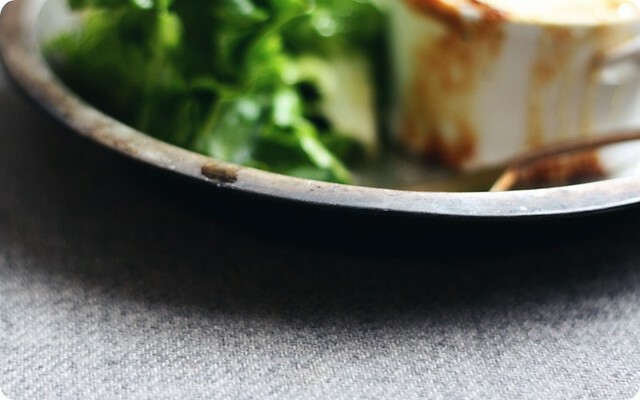 My favorite gratin dish is a circular pan 14 inches in diameter and 2 inches deep. If you don't have a large dish, make 2 smaller gratins. Just make sure the dish is not too deep. To assemble the gratin, place a cutting board on the counter between the bowl of potatoes and the baking dish. Using a mandoline, if you have one, slice a few potatoes at a time, as thin as possible. Quickly lay the potato slices in the bottom of the pan, overlapping them to make one layer. Sprinkle lightly with salt and pepper. Slice a few more potatoes and make another layer. Continue in this fashion, seasoning each layer, until all the potatoes are used. Pour the cream over the potatoes and tilt the pan to distribute it well. With your hand, push down on the top layer to even out the pile. The cream should just barely cover the potatoes. Add a little more if necessary. Dot the surface with the butter, then cover the dish tightly with foil and put it in the oven. Bake for 30 minutes. 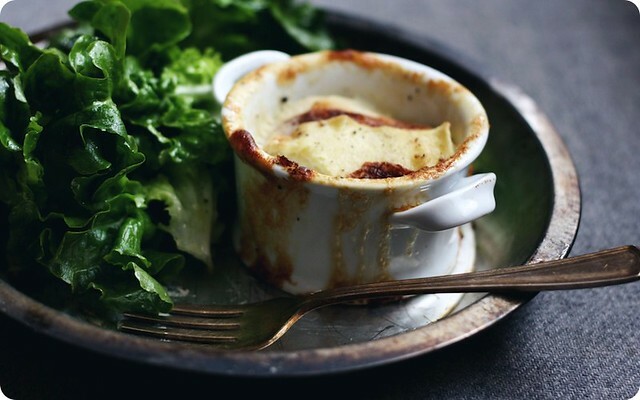 Obviously, there are many other delicious ways to make a gratin. For a good cheesy version, sprinkle an assertive cheese, such as a Swiss Gruyère or Raclette, or even Fontina, between each layer of potatoes. You'll need about 2 cups of grated cheese. There's a Swedish version of the dish called Jansson's Temptation, which calls for anchoivies and onions and is excellent for breakfast or lunch. To make a good approximation of Jannson's, I mix 1 large onion, sliced thin, with about 12 anchovy fillets, rinsed and roughly chopped, and divide the mixture among the layers. Bake as for the classic gratin.